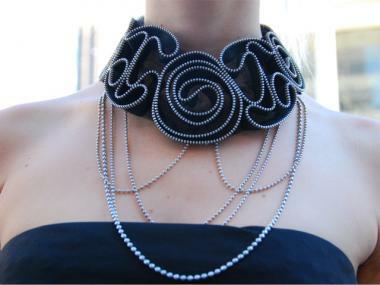 Alissa Lentz's necklace is made from an old shirt detail and recycled chains. LINCOLN CENTER — When budgets are low, the best way to get something done well is to do it yourself. That's the mantra many fashionistas are following as they head to the Mercedes-Benz Fashion Week at Lincoln Center, bringing with them D.I.Y. shoes and accessories crafted out of everyday materials. Home-bedazzled shoes, bullets strung into a necklace and a headpiece made entirely of forks are some examples of the do-it-yourself fashion statements seen at Fashion Week this year. Fashionistas often wear the pieces with inexpensive yet stylish clothing, nestled in amongst the haute couture crowd wearing Prada, Lanvin and other big designers. Many fashionistas say these pieces are examples of a growing trend — crafting pieces on the fly in order to be fashionable on a budget. "It's blowing up," entrepreneur Alissa Lentz, 22, said about the D.I.Y. Fashion Week trend, which also included remodeled thrift store clothing. "It's really great because not only does it allow people creative freedom, but it puts the eco-friendly movement on the forefront of fashion," Lentz said. "Everything's recycled." Lentz came to Fashion Week on Friday wearing a necklace she had created from an old thrift store shirt her grandmother picked out and random chains she found in her junk jewelry collection. An aspiring bag designer, Lentz says she is inspired by the number of designers and bloggers who are turning to thrifts store finds to create new pieces. "There's a huge community behind it now," Lentz said. Her friend, San Francisco-based fashion blogger Lindsey Louie, agreed. "I totally support people who make the most of what they have," Louie said, wearing a D.I.Y. necklace of antique bullets strung created by the small Silent Gypsy line. "It's not about money - it's about creativity," she added. Artist Carlos Demedeiros took creativity to a whole new level, creating a headpiece made entirely of forks and brown string. He had found the forks in a thrift store for a dollar and decided 10 minutes before his arrival that they would make the perfect accessory to star-gaze outside the tents at Lincoln Center. "I've decided to come out of the fashion closet," Demedeiros, a Jersey resident who owns a studio on the Upper West Side, said. "To be honest, I'm very shy. But today I wanted to wear one of my creations to Fashion Week." While many D.I.Y. designers aim to be completely original, others find their work is more inspired by established designers. Bronx resident and jewelry entrepreneur Ashley Rudolph, 25, warned that while it's fine to find inspiration from established names, D.I.Y. creators should be careful not to become exact copycats. "D.I.Y. is a really big movement right now, but the really important thing is to not totally rip of the designers - just let the inspiration show," Rudolph said. Wearing Steve Madden shoes that she had sparkled with gold glitter, Rudolph said she was trying to carefully emulate Miu Miu. To make sure she's different, Rudolph added that she always uses different color palettes from the look she's imitating. "It takes confidence and research," she added. "A lot of research." To read more of DNAinfo.com's Fashion Week coverage, click here.